I spent about half of my time this week watching some old favourites, including Back to the Future, the Shawshank Redemption, Twelve Monkeys and The Silence of the Lambs - all of which are classics which I can return to time and time again. In terms of new films, there wasn't too much to shout about - for the most part, these ranged between films which were completely forgettable (The Deep Blue Sea, Flirting With Disaster) or interesting but flawed (Diva, The Cell, Timecrimes). Only one movie which I saw for the first time really stood out for me. Ruby Sparks is an interesting comedy drama from the directors of Little Miss Sunshine, scripted by Zoe Kazan, who also plays the title role. It's the story of a neurotic writer (Paul Dano) who is shocked to discover that the idealised dream girl he has created in his latest novel has come to life and moved in with him. This concept isn't wholly original - I've seen aspects of it before in films like Adaptation, Weird Science, Secret Window and Stranger Than Fiction. However, it is a rather interesting spin on the idea, with Dano finding to his horror that attempting to alter aspects of his dream girl's personality can cause her to suffer great pain. With this type of quirky comedy drama, I find that it's necessary for the actors, directors and screenwriters to have a particularly delicate touch to pull it off. Get it right and you've got something sweet and whimsical on your hands; overdo it and you're left with something sickly and nauseating, likely to be found on the next edition of Nathan Rabin's MPDG list. Fortunately, on this occasion, the collaborators behind the film have worked a minor miracle and made a funny, touching and quietly moving picture. I saw just one new release in the cinema this week - it was Hitchcock, Sacha Gervasi's biopic of the master director's attempts to bring Psycho to the big screen. In adapting such a controversial book, Hitchcock was forced to go outside the studio system and finance it himself, something which put a great strain on his marriage to long suffering wife, Alma. Although this is an interesting idea in theory, in practice it's rather mundane. There isn't much jeopardy here - we all know that Psycho is going to be a great success, and that Hitch isn't going to find himself financially ruined and blacklisted in Hollywood after its creation. Although the movie doesn't depict Hitchcock in the most flattering light, it seems to be pulling its punches; his obsession with his leading ladies is hinted at, but never really properly explored. Anthony Hopkins (as Alfred Hitchcock) and Helen Mirren (as Alma) both provide solid performances, but fail to inject much life into the film. 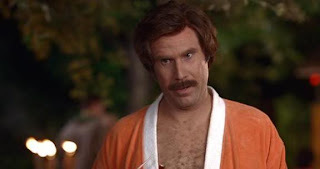 "Ron Burgundy: I don't know how to put this, but... I'm kind of a big deal.